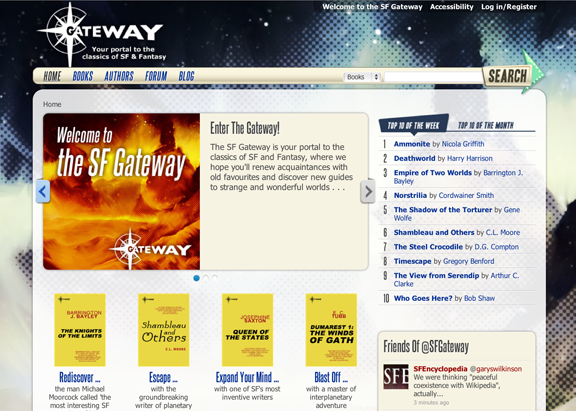 The SF Gateway is your portal to the classics of SF and Fantasy, where we hope you’ll renew acquaintances with old favourites and discover new guides to strange and wonderful worlds . . .
And look, for one brief shining moment, Ammonite is number one! Chortle. It’s the first time in years Ammonite and Slow River have been available outside the US. I’m pretty happy. All writers want to be read. That’s the point. This is a pretty damn good Monday for me. More importantly, the Encyclopedia of Science Fiction also just went live. Lots and lots of luscious information: all free. These two portals combined are going to be an incredible resource. Hats off to all those involved.